As I mentioned in Monday’s post, I’ve plowed through quite a few books since my last reading update, so I decided to split this month’s reading wrap-up into two parts. 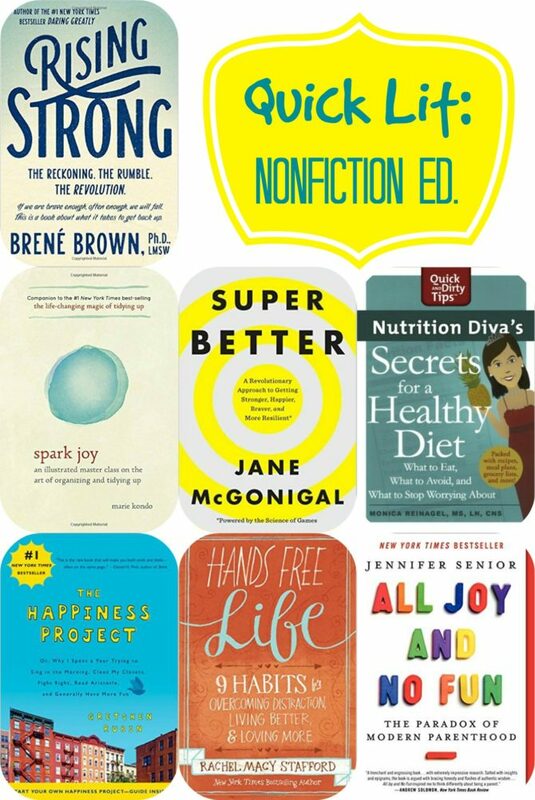 On Monday I shared the fiction books I’ve read recently and today, as promised, I’ve got reviews of the nonfiction books I’ve read in recent months. Rising Strong, by Brené Brown: A year ago I had never heard of Brené Brown, but over the past several months I’ve become quite a big fan of her work and her message. Her latest book addresses her usual themes of shame, authenticity, and vulnerability. 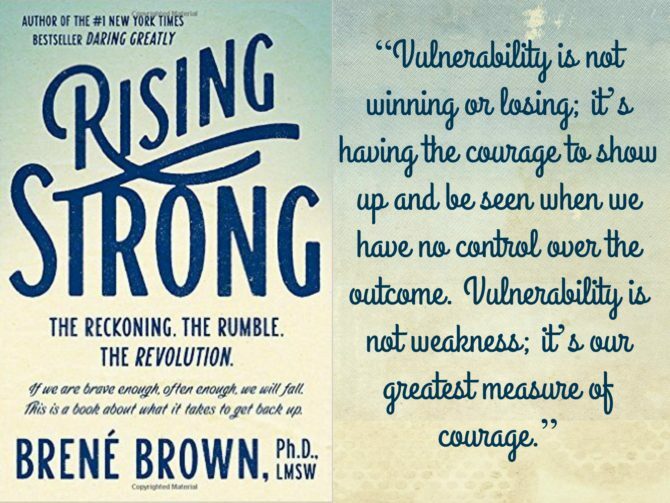 Specifically, Rising Strong walks us through the process of getting back on our feet after the falls that inevitably occur when we have the courage to be vulnerable (a messy business, but one with limitless rewards, as this book so beautifully illustrates). Brown explains how we can lean into our personal stories in order to find meaning and wisdom, and she candidly shares several personal anecdotes; I was so encouraged to see that even the experts still struggle to practice what they preach! Brown’s writing is funny and conversational, and she comes across as both professional and relatable. Rising Strong is filled with powerful takeaways, from tutorials on being mindful to explanations on why things like regret and failure can actually be positive forces in our lives. I listened to the audiobook and frequently found myself rewinding the audio so I could re-listen to a poignant point. I’d be hard pressed to choose a single favorite takeaway, but the most helpful quote from the book was Brown’s definition of integrity: “Integrity is choosing courage over comfort; choosing what is right over what is fun, fast, or easy; and choosing to practice our values rather than simply professing them.” Integrity is my word for the year, and I will definitely be embracing this specific definition in the coming months! Though I loved a lot about Rising Strong, it seemed to lose steam towards the end. I also felt the book would have benefitted from a more thorough explanation of Brown’s “research”: as much as I love stories and case studies, the nerd in me also likes to see a bit of qualitative data! Nevertheless, I am so glad that I read Rising Strong and would highly recommend it to anyone struggling to overcome life’s failures and disappointments. My Rating: 4 stars. Spark Joy: An Illustrated Master Class on the Art of Organizing and Tidying Up, by Marie Kondo: I read Kondo’s first book last year, and while I had some reservations about some of the book’s principles, I saw the value in Kondo’s method and was inspired by her mantra to keep only the items that bring you joy. I’ve done quite a bit of tidying recently, but there is still plenty of room for improvement; our move really highlighted how much superfluous “stuff” we have so I was eager to get some much-needed purging motivation from Kondo’s latest book. 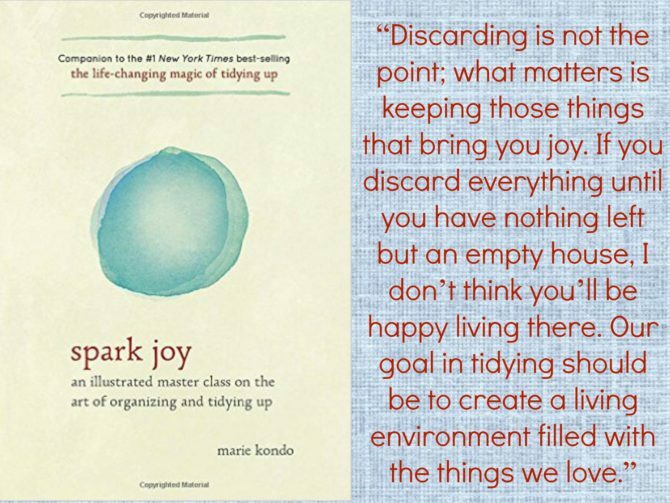 Spark Joy is a great companion piece to The Life-Changing Magic of Tidying Up. In it, Kondo elaborates on her method and guides readers through tidying specific categories, offering advice on how to create joy-filled space in each room. I found this book much more accessible than her first, and though it contained more of Kondo’s trademark “mysticism,” her premises are valid and easily attainable, and I enjoyed adopting many of her suggestions as we set up our new home. This book is technically an illustrated guide, so I was at first reluctant to listen to the audio version. However, I thumbed through a physical copy at Target before listening, and found the images to be more decorative than useful; as it turned out, the audiobook worked out just fine. My Rating: 4 stars. 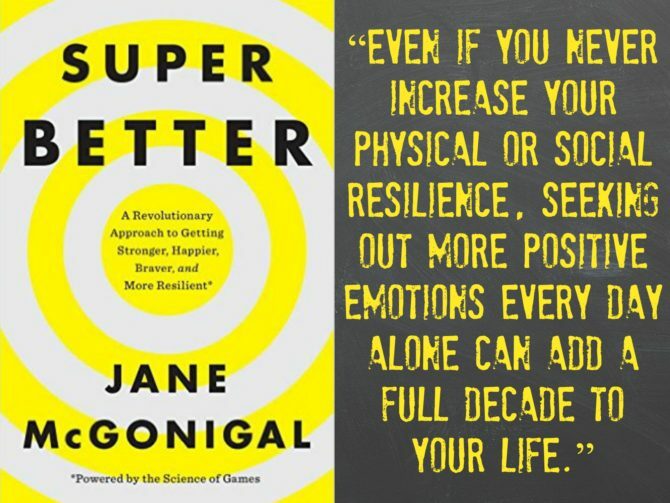 SuperBetter: A Revolutionary Approach to Getting Stronger, Happier, Braver and More Resilient–Powered by the Science of Games, by Jane McGonigal: I heard game designer Jane McGonigal interviewed on the Tim Ferriss show last year and was fascinated by her story of how she used several gaming principles, and even video games themselves, to heal her brain after a concussion. In SuperBetter, McGonigal shares the science behind the benefits of digital gaming, specifically as it relates to trauma recovery and mental health. She then elaborates upon the SuperBetter method, which uses gamification to overcome challenges and build resilience. The book includes nearly 100 fun challenges to promote gameful strengths, accompanied by anecdotes from those who have reaped the benefits of tapping into this mindset. Though I’m not into video games, I love this unique spin on self help and am already implementing some of the book’s challenges and strategies to become SuperBetter myself. McGonigal had provided an excellent tutorial for anyone seeking a positive way to tackle a daunting challenge. My Rating: 4.5 stars. 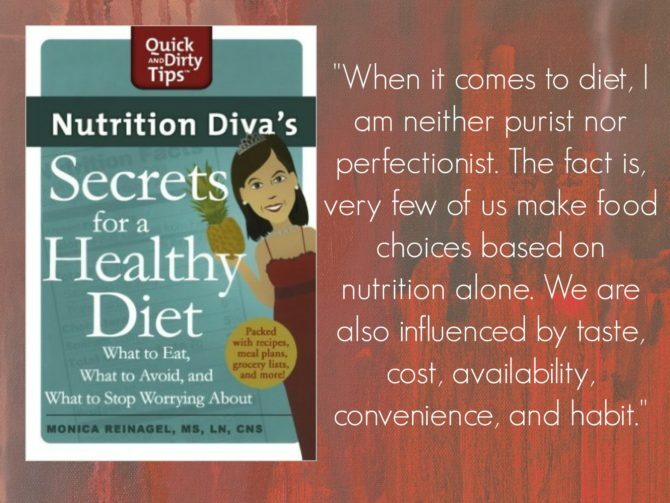 Nutrition Diva’s Secrets for a Healthy Diet: What to Eat, What to Avoid, and What to Stop Worrying About (Quick & Dirty Tips), by Monica Reinagel: I regularly listen to the Nutrition Diva podcast, as I appreciate Monica Reinagel’s sensible and practical nutrition advice (in a world where sensible isn’t always popular). This book takes the same approach, living up to its subtitle by helping readers discern what to eat, what to avoid, and what to stop worrying about. The book begins with a thorough walk through the aisles of the grocery store, highlighting the best options and explaining why certain foods are better or more important than others. Subsequent chapters offer advice for specific meals, recipe ideas, and sample meal plans. In my favorite chapter, Reinagel dispels common myths and downplays much of the hype surrounding specific diets and nutrients.The information in the book is extensive, and sidebars throughout the book highlight the key points, making the the material much easier to digest. Reinagel’s message can be summed up in these points: we should all be eating more vegetables and less sugar; moderation is key; when we have these key components in place there is still plenty of leeway for a healthy diet within a variety of different eating styles. This book is a great tool for someone starting out on a journey to healthier eating who wants to avoid trendy diets or nutritional mandates. My Rating: 4.5 stars. The Happiness Project: Or, Why I Spent a Year Trying to Sing in the Morning, Clean My Closets, Fight Right, Read Aristotle, and Generally Have More Fun, by Gretchen Rubin: Gretchen Rubin’s podcast has become one of my favorites, and her book Better Than Before was one of the best books I read last year, so of course I was excited to read the book that launched her career as a self improvement expert! 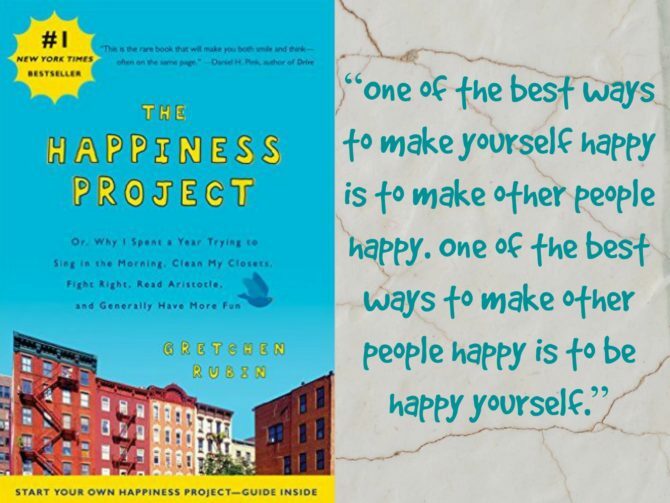 In The Happiness Project, Rubin documents her year-long experiment to increase her personal happiness. Each chapter of the book addresses a different happiness theme (with a unique set of resolutions for each month of the year), and describes Rubin’s personal experiences as well as those from some of her blog readers. These anecdotes are supplemented with research and personal insights. I’m a total sucker for this sort of self-experiment memoir, so this book was right up my alley. Though I didn’t love The Happiness Project quite as much as Better Than Before, I found it inspiring and incredibly entertaining. I related so much to Rubin on a number of levels, so her suggestions were highly relevant (though her negative self reflections sometimes hit a bit too close to home!). Some reviewers have referred to Rubin as self-absorbed, but I personally found the opposite to be true (though this might be because I’m already familiar with her through other sources); if anything, her self abasement sometimes grew a bit tiresome. Rubin is highly self-aware and she does a good job of preemptively addressing many of the objections such a project would inevitably face, such as what qualifies her (an admittedly privileged individual) to write such a book, or whether or not happiness can truly be pursued. Because this book was written a decade ago, it was interesting to see how far Rubin has come personally and professionally in subsequent years, and to read the origins of much of her current research. (It was also entertaining to read about 7-year-old Eliza, who is now a high school junior and has a podcast of her own!) My Rating: 4 stars. 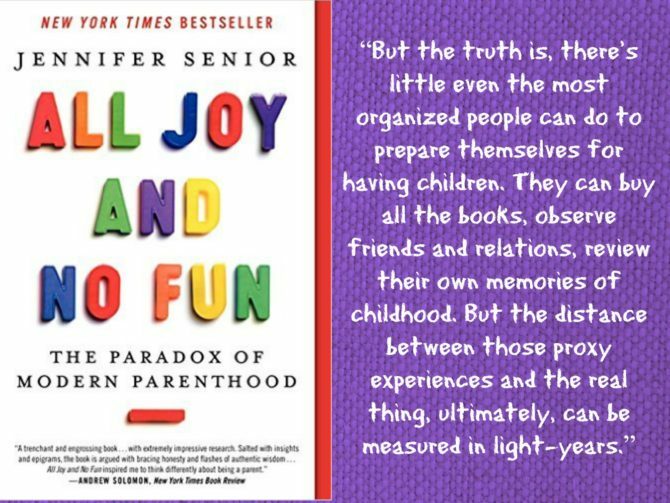 All Joy and No Fun: The Paradox of Modern Parenthood, by Jennifer Senior: Parent books are a dime a dozen, but his book takes a different perspective than most, focusing not on the children but on the parents and how we are shaped by our kids. Senior draws from numerous studies, sociology, history, and her own scientific observations of several families to paint a picture of how parenting has changed and to explain the conflicting emotions many moms and dads feel toward their roles as parents. I found this book equal parts fascinating and terrifying: it validated many of my own feelings about motherhood but much of the book has me rethinking many previous convictions and methods regarding how we plan to raise our kids. (Stories of overbooked teens and entitled adults can do that!) Specifically, the book has me evaluating my own contributions to our child-centric society and it has opened my eyes to the mommy martyrdom to which it is so easy to fall prey. I didn’t agree with all of Senior’s (very liberal/socialist) views and I do wish she provided more answers rather than simply starting a discussion about these topics, but they ARE important discussions that we all need to be having. My Rating: 4 stars. Hands Free Life: Nine Habits for Overcoming Distraction, Living Better, and Loving More, by Rachel Macy Stafford: In our social media-obsessed, busyness-glorifying, mile-a-minute culture, it’s easy to neglect what’s important in favor of the shiny non-essentials that steal our time and attention. 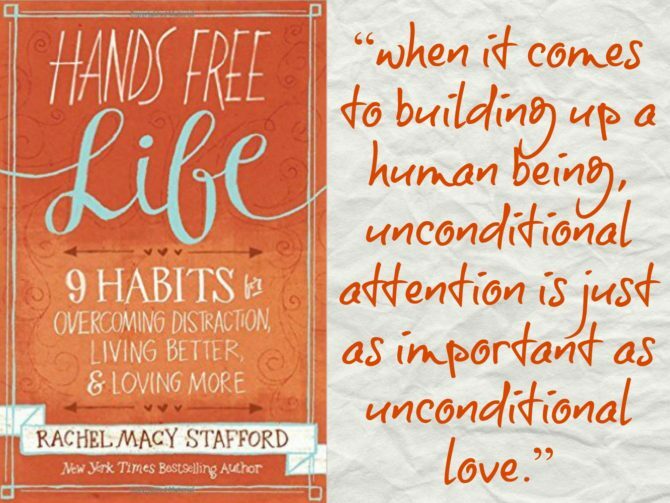 In Hands-Free-Life, Rachel Macy Stafford suggests nine habits to help readers shed our addiction to distraction in order to achieve a more meaningful and fulfilling life. I LOVE the premise of this book and came away with some excellent reminders for living with greater purpose and intention. Unfortunately I did not care for the poetic writing style and overuse of repetitive anecdotes, and I would have appreciated it much more if it had been about half as long. I found Hands Free Life similar to The Happiness Project, and though I did like the spiritual tone of this book, I much preferred Gretchen Rubin’s treatment of this subject. My Rating: 3.5 stars. I’m just now noticing that by sheer coincidence, I seem to have read a lot of books about becoming happier lately! So funny how the books I choose to read tend to follow trends. Have you read any of these books? What did you think of them? If you’re looking for further reading inspiration, check out Modern Mrs. Darcy’s site, where other bloggers are sharing about what they’ve been reading lately!